Play with your food and score a few touchdowns while you're at it with this football-shaped mug. Sure to score big with little leaguers or grown-up fans of the game, this touch-down idea encourages everyone to play with their food. 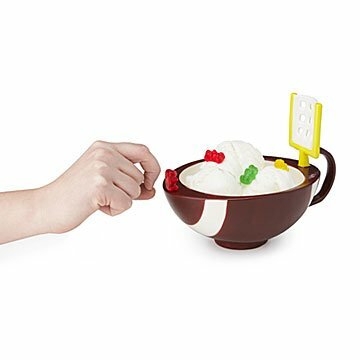 Designed by Max, a young entrepreneur and sports fan, the oversized cup is shaped like half a football, and the handle sports a mini-field goal to catch marshmallows for cocoa, crackers for soup, or toppings for ice cream. Made in Thailand. Make it a collection with The Mug with a Hoop, The Mug with a Goal, The Mug with a Glove, and The Mug with a Net . My brother uses it for whatever he wants (mostly cereal) often and it's survived the dishwasher, so I'm giving it five stars. It says mug, but it's bigger than an average mug. Good for ice cream, as advertised, soup, drinks for mugs, etc.